Not the best time for a mission mixture. I know summer is coming and we have better things to do than waiting near the sink soaking stamps. BUT it doesn’t mean we should not keep an eye out on some nice job lot for next fall. I often list smaller stamp mixtures, mainly under a pound, so for a change I went and find an interesting mission mixture / “job lot”. 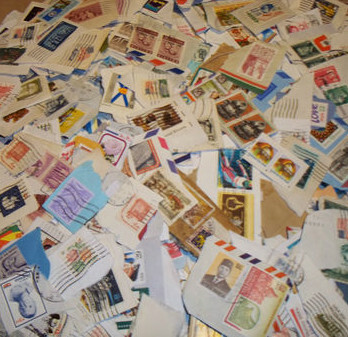 This is for 3 1/2 lb of worldwide stamps, not especially close cut. Seller has quite a few pictures so you can get a good feel about this mixture. He does ship worldwide from the USA, although it’s rather expensive. That’s a bit over 1.5 kilos of on paper stamps. Might be a fun sort either for a collector or a reseller located in the USA (unless you don’t mind the shipping price, but on big lots like that, shipping overseas is often a deal breaker). It’s on buy now so first come first serve (unless the seller list more in the future).